I'm always looking for new banana recipes since I never seem to have a shortage of ripe bananas. My ripe bananas never go to waste! If I am not ready to use them when they are ripe, I peel them and stick them in a baggie and freeze them. I was drawn to this recipe because of the cream cheese centers. Although I liked the addition of cream cheese to these muffins, my kids didn't care for it. There are a lot of flavors just with the bananas and chocolate chips, so the addition of the cinnamon flavored cream cheese may have been a bit too much. These muffins would certainly be delicious even if the filling was omitted. Or, another option would be to keep the filling and eliminate the chocolate chips. This recipe makes 12 very large muffins! I used all the batter and filled the muffin cups full. As you can see, the result was big, beautiful muffin tops! 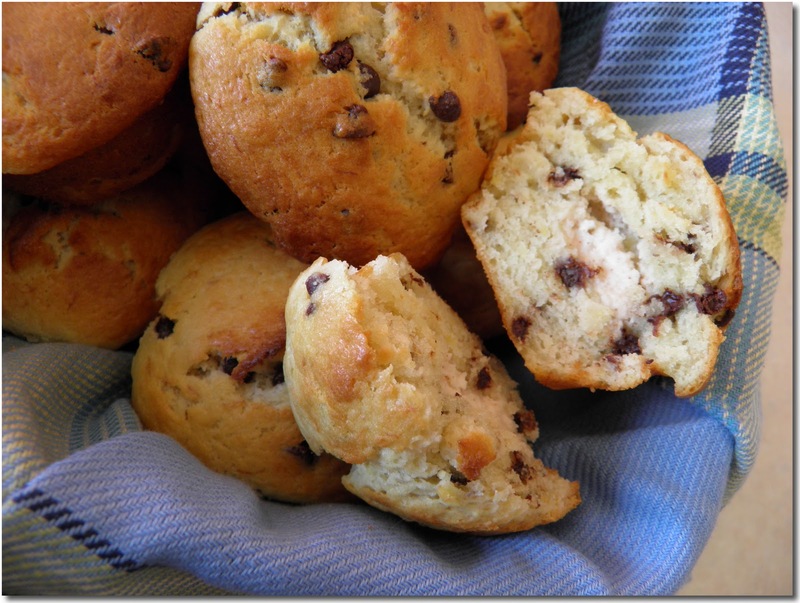 Chocolate chip banana muffins with cream cheese in the center. 1. Preheat oven to 400°F.2. Combine the flour, sugar, and baking powder.3. In separate bowl combine the eggs, bananas, butter, milk, sour cream, and vanilla.4. Stir wet ingredients into dry ingredients until just moistened.5. Sir in chocolate chips.6. Fill 12 greased or paper-lined muffin cups half full.7. Beat the filling ingredients in a small bowl until smooth.8. 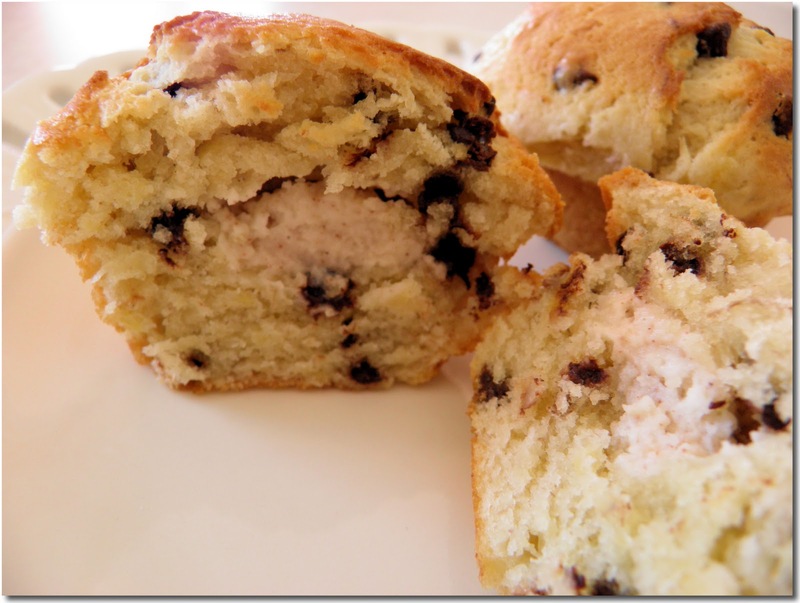 Drop by teaspoonfuls into the center of each muffin.9. Top with remaining batter.10. Bake at 400°F for 18-22 minutes, or until done.11. Cool for 5 minutes then remove from pan. My word, cream cheese centers... how divine! If I could reach through my monitor, I'd snap one of those up in a heartbeat. The banana, chocolate chips and cream cheese - a heavenly trifecta! This is beautiful..love the photos and ingr.! Tempting!!! yummmm!! will have to try! I would love to have a couple of them for the breakfast! They look so delicious! What an interesting muffin. That cinnamon cream cheese sounds delightful. I'm wondering if instead of using the cream cheese as a filling you could just mix it in with the batter....the taste would be more subtle but still present. Thanks for the comments and follows! @briarrose--that is a great idea! I think the cream cheese would be very good mixed in!